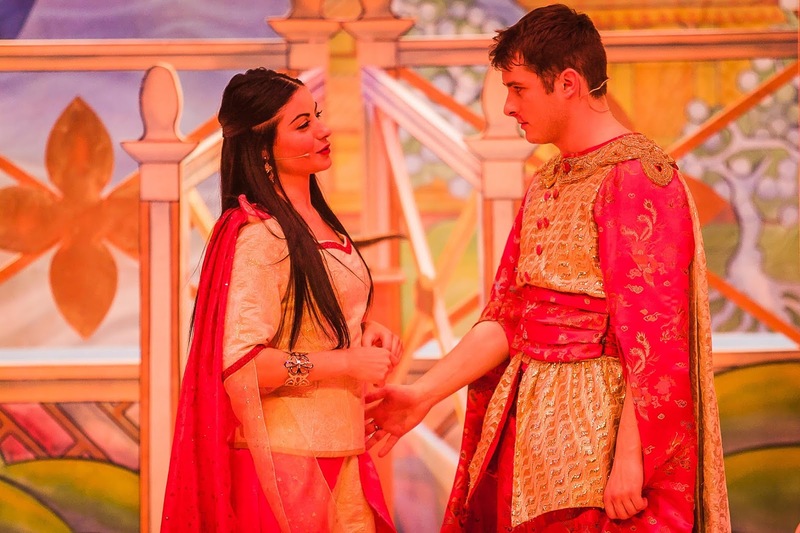 Entertaining Elliot: Aladdin at Lighthouse, Poole - Panto Review! At the grand old age of 35, I have never been to a pantomime. It never appealed to me...that was until I became a parent! I really enjoy taking Elliot to the theatre and now he's 4, his attention span is so much better so he's able to sit through longer shows without getting too fidgety. This year seemed a perfect time for our first ever panto! This years local pantomime at the Lighthouse Centre for the Arts in Poole was Aladdin, written and directed by Peter Duncan who readers of a certain age (ie old like me!) will remember from Blue Peter back in the 80's. It promised to be lots and fun and we were excited to see how Elliot would enjoy it! When we arrived there was a real buzz in the theatre and rather than having to wait for the show to start, there were already circus performers on stage entertaining the crowd. They asked for a volunteer to walk along the tightrope and a young lad jumped up on stage but after he fell off and banged his head, it became clear to the audience that it was actually Max Bowden (Waterloo Road) and ta da, Aladdin had begun! We were soon introduced to the other characters including the hilarious Widow Twankey, the evil Abanzer (Peter Duncan) and beautiful princess XiaoXue, played by Emmerdale actress Sapphire Elia. The Aladdin storyline hasn't been tweaked too much but there was plenty of audience participation, lots of booing and hissing (Elliot loved this! 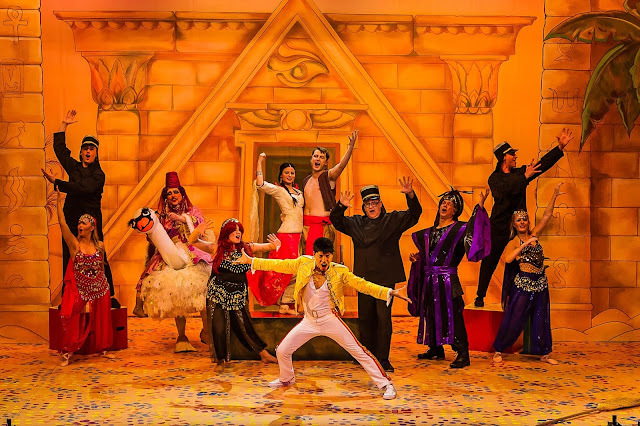 ), brilliant songs and choreography and even a flying carpet ride! 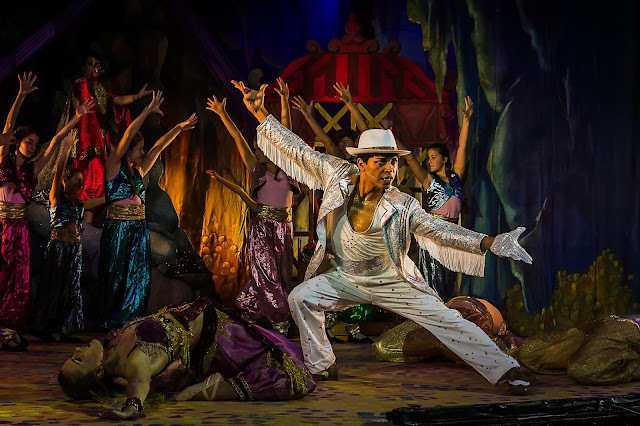 The leading characters all have great chemistry but the star of the show has to be Miguel Angel who plays the Genie...the Genie as you've never seen him before! Belting out hits from rock gods of the past including David Bowie, Freddie Mercury and Michael Jackson, he really stole the show and I couldn't wait to see what he'd sing next! The best bit of the show for me was when the storyline went off track and the genie's magic made everyone sing about what they'd be doing if they weren't in panto. Great singing and acting from the whole cast but what made it was the 100+ cubs and scouts in the audience joining in with the Honey G dancing - absolutely hilarious and it was certainly a sight to see! Our first panto experience was alot of fun and Aladdin is a real family friendly show. The pantomime isn't too long so it's perfect for little ones and they are sure to be entertained. We will definitely back for next year's pantomime!